Converted 17th Century barn. Two luxury self catering holiday cottages in the rural Lake District National Park hamlet of Redmain 2 miles from Cockermouth sleeping 4 and 2 plus baby. 4 Star accommodation. Beautiful gardens of 2 acres. Bassenthwaite Lake and Whinlatter Forest Park closeby. Dogs by arrangement only. Short breaks available. Children welcome Private parking Accepts credit cards. A non-refundable deposit of £100 is required when booking (payable to Mrs. Christine Neale). The outstanding balance to be paid four weeks prior to arrival. A receipt will be sent confirming your booking. The cottages are available from 4:00pm on the day of arrival and should be vacated by 10:30am on the day of departure. We will charge an additional half day if the client leaves late for any reason. Weekly bookings are normally Saturday to Saturday, but short breaks can be arranged starting on the day of your choice as long as it does not go across a peak week. 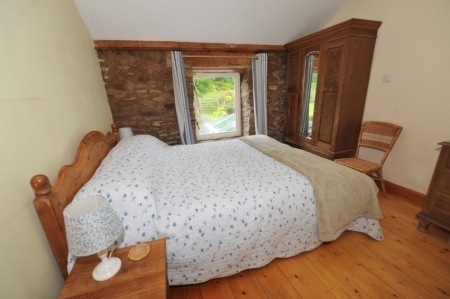 All prices include oil fired central heating (06:00 to midnight), electricity, towels and bed linen. The number in the party must be stated and must not exceed the maximum of 4 people (+baby up to 15kg in weight only) in the Cottage and 2 people (+ baby up to 15kg in weight only) in the Hayloft. All amenities provided by the owner’s for guests are used entirely at the guest’s risk and no responsibility will be accepted by the owner’s other than resulting from the owner’s negligence. Care of accommodation:- Guests are required to treat our Cottages with due care. It is a condition of booking that should any damage occur the cost of damage may be born by the party concerned, at the discretion of the owners. Pets:- We only accept a single dog by special arrangement. The dog is not allowed on any furniture, beds or in the bedrooms due to some of our clients having asthma. The dog is not left on its own in the cottage and stays with the owner at all times. The dog is not allowed to foul in the gardens and if it does you will \\\"scoop the poop\\\". We charge an extra £15 for the dog. Broadband 24/7 internet access cable (Cat 5 Network) and Wifi wireless access point for connection to your own computer equipment is available and charged at an extra £15 per week or short break stay. Please note that use of this Wifi Broadband is based on the guest’s basic use for email and browsing the Internet. Usage on our monthly bandwidth is limited and it is, therefore, not possible to make heavy downloads such as video and music without incurring extra charges. We use software to track online use, and hold the right to charge extra for any heavy downloads. We thank you for your co-operation. Cancellations:- When you book any holiday you are entering into a legally binding contract. If you have to cancel or cut short your holiday for whatever reason, then you will be liable for any cancellation charges we may have to make. In your best interests, we therefore strongly advise you to take out holiday and cancelled booking insurance to safeguard your holiday. and hold the right to charge extra for any heavy downloads. We thank you for your co-operation.